Odin (Anthony Hopkins), long the ruler of Asgard, is about to pass the crown on to his son Thor (Chris Hemsworth) when the ceremony is rudely interrupted by the Frost Giants of Jotunheim. Thor considers this an act of war, and responds accordingly. He does so against his father’s wishes. Odin, angered by his sons’ remorseless and arrogant defiance, strips him of his powers and banishes him to earth. There he is to live as a mere mortal until he proves himself worthy of reclaiming his birth right. As these events transpire, Thor’s brother Loki (Tim Hiddleson) uncovers a secret which will forever alter his relationship to both his father and brother. Thor is not just the latest adaptation of a Marvel Comics title. It is also the first foray into their shared cinematic universe that functions as a full on fantasy. Every Marvel film to date has had a decidedly sci-fi lean, and now Thor attempts to add a dash of Norse magic into the mix. Director Kenneth Branaugh, known for his acclaimed adaptations of Shakespeare’s classics, goes about his duties like an alchemist. Being that this is in many ways virgin territory for him, his hand is not always as sure as it should be. Nonetheless, he brings a sense of whimsy that is both disarming and appealing. All hail the mighty Thor! Visually, Thor feels like a throwback to the science-fiction/fantasy adventure films of the eighties, but not of the Lucas/Spielberg variety. The film that instantly comes to mind is 1980’s Flash Gordon. 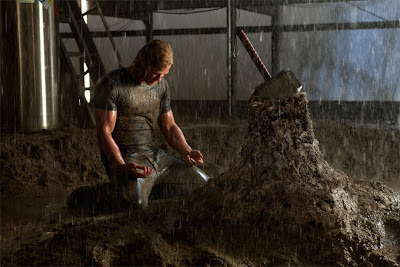 Aside from the sometimes campy sense of pageantry on display in that film, Thor also shares its love of Dutch angles. 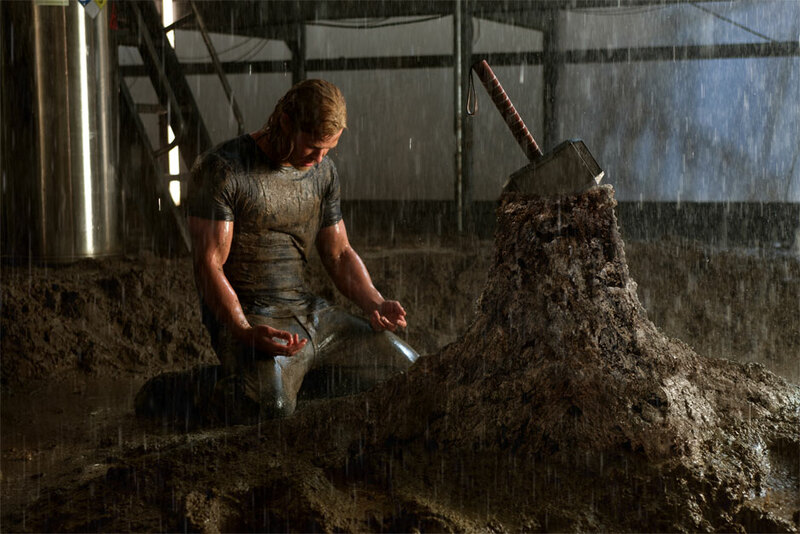 That’s not to say that Thor revels in camp quite as much as that Dino De Laurentiis production. 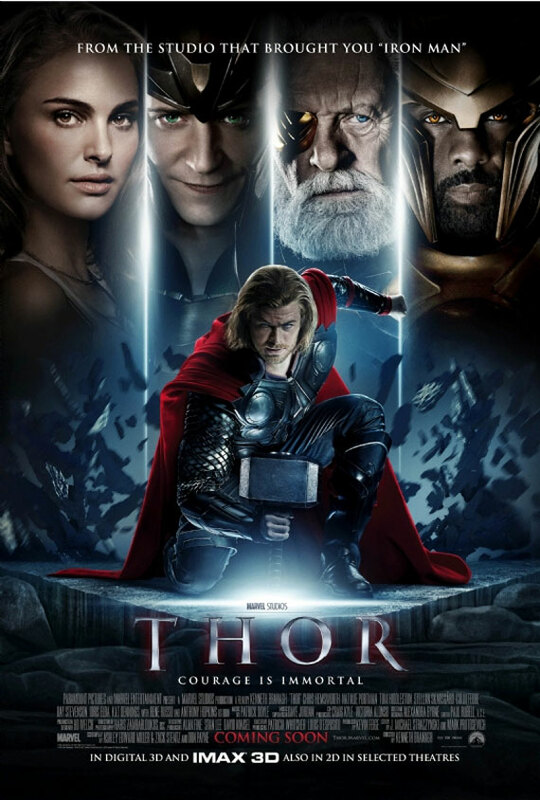 Thor does take itself a bit more seriously and contains better acting, effects, and writing. However, it definitely owes more than a bit of its visual sensibilities to Flash Gordon. Krull can also be counted among its visual influences, as its mixture of science fiction and fantasy makes it a very distant forerunner to Thor. The action scenes develop a rather uneven rhythm right from the outset. They are exciting in concept if not always in execution. The Frost Giants are visually striking, but the battle of Jotunheim takes place in a shroud of darkness that makes the action hard to see. The camera angles and cutting are also a hindrance. However, things stop every once in a while for some memorable and show stopping moments that more than adequately display Thor’s powers. These are the moments where Branaugh and his FX technicians seem the most confident in themselves and their source material. Branaugh’s Shakespearian roots show the most during the dramatic moments, where the dialogue is delivered in as theatrical and stagy a manner as possible. This is a choice which is right in line with the Thor universe, and thankfully it does not come off as silly. The themes of Patricide and sibling rivalry naturally lend them selves to such a grand, melodramatic presentation. When Thor is on earth, his speech and mannerisms remain the same, which provides fodder for the expected “fish out of water” hilarity. It mostly works, though it is extremely cliché. Chris Hemsworth is as capable a centerpiece for Thor as a fan could hope for. His look, presence, and body language radiate the energy of an Asgardian prince. His personality is also fitting, as he remains unabashedly likeable throughout. He hits all of his marks with ease. Anthony Hopkins, who is no stranger to this territory, also slides easily into the role of Odin. Tim Hiddleson refuses to allow his character to become marginalized by his larger than life cast mates. He turns up the volume of his performance so that he too will be heard and remembered. Natalie Portman, as the scientist and love interest Jane Foster, gets hopelessly lost in the mix. Like its title character, Thor overcomes its shortcomings and eventually wins the audience over with its charm and sense of wonder. This is easily one of the most likeable and fun characters in Marvel’s cinematic cannon, and this film is a surprisingly competent showcase for him. It suffers from the expected pacing problems and apprehension of most origin stories, but it pushes on nonetheless. I can easily imagine Chris hemsworth stealing the show from Robert Downey Jr. in The Avengers, and I look forward to the further adventures of this big lug from a far away realm.